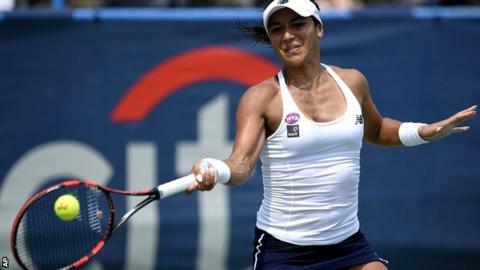 British number one Heather Watson qualified for the main draw of the Rogers Cup in Toronto with a three-set win over Australia's Jarmila Gajdosova. The 23-year-old beat Gajdosova 6-1 3-6 6-2, having beaten Elena Vesnina in the first round of qualifying on Saturday. James Ward missed out on a place in the main draw of the men's event, which takes place in Montreal, after a 6-2 6-4 loss to Colombia's Alejandro Falla. Andy Murray is seeded second for the Masters 1000 tournament. The Scot has a bye in round one and will play Tommy Robredo or Feliciano Lopez in his opening match, while top seed Novak Djokovic faces Thomaz Bellucci or Pablo Cuevas. Roger Federer has chosen to skip the Canadian event and will return in Cincinnati later this month. In Toronto, Watson joins a field headed by world number one Serena Williams and second seed Simona Halep, with Maria Sharapova absent because of a leg injury.